Humans are an especially social species, even relative to the general sociality of higher primates. Our species’ long-standing commitment to – and success at – living in large groups may have even relegated the problems of physical survival secondary to the complexities of navigating the social world (Caporael & Brewer, 1991). Unsurprisingly, many of the cognitive and perceptual faculties we engage for the social domain are particularly sophisticated and precocious. Within a few minutes of birth, babies orient to faces around them (Farroni, Csibra, Simion, & Johnson, 2002) and even begin mirroring their facial expressions within hours (Meltzoff & Moore, 1977). Within a year, infants have begun to reference others emotional expressions (Sorce, Emde, Campos, & Klinnert, 1985) and direct others attention using their own eye movements and gestures (Liszkowski, Carpenter, Henning, Striano, & Tomasello, 2004). These nonverbal social cues support the early development of language (Brooks & Meltzoff, 2005) and theory of mind (Baron-Cohen, 1991) – two of our species’ singularly defining social faculties. The immediate urge to look to where someone else is looking to – termed reflexive gaze following – is one of the most distinguishable and intensively-studied products of these social perceptual processes. Research on how visual attention can be captured – and directed – has been reinvigorated by the study of social cues stimuli such as eye and head direction and pointing (Frischen, Bayliss, & Tipper, 2007). Although studied with many paradigms (e.g. visual search, dot-probe, change-detection), the Posner spatial cueing task (Posner, 1980) has proven uniquely well-suited and easily-adapted to the study of social cueing. The Posner task evaluates both 1) how powerfully and quickly objects and events can capture visual attention and 2) how effectively objects and events can direct our attention to other locations – just as social cues need to be readily attended and acted on in the real world. The figure above illustrates the basic Posner task in which participants fixate the center dot and press a key when the small black square appears in one of the boxes on either side. The top row illustrates a peripheral cue wherein a potential target location is briefly highlighted, drawing attention to that location. This can either cause targets to be detected more quickly when the cue is valid, that is predictive of the target’s location, or delay target detection when the cue is invalid (drawing attention to the opposite location). Peripheral cueing occurs very quickly and automatically (reflexive) – capturing attention and affecting participants’ responses even when highly counterpredictive (i.e. the targets appears in the box opposite of the target in up to 80% of the trials; Jonides, 1981). Despite knowing that such cues are most often misleading, participants cannot ignore their appearance. Central cues, such as the arrow shown in the middle row of the figure, can direct attention either validly, speeding target detection or invalidly, slowing target detection. Central cueing occurs less quickly and diminishes when they prove uninformative or a hindrance to target detection (Jonides, 1981). Symbolic, nonbiological stimuli such as arrows can even drive attention in the same way as directed eyegaze when unpredictive (Tipples, 2002). But only directed eyegaze, like that in the bottom row of the figure, remains capable of driving attentional shifts when patently misleading (termed counterpredictive) of appearing objects’ locations and should be ignored (Downing, Dodds, & Bray, 2004; Friesen, Ristic, & Kingstone, 2004). Directed eyegaze may thus be uniquely resistant to cognitive control – triggering shifts of attention that are automatic (reflexive) and extremely fast – that is beginning within 1/10 of a second (see Frischen et al., 2007 for review). Whereas research on gaze perception has typically been conducted without the complicating possibility of deceit, it is as likely an inherent faculty of our species as the honest, prosocial uses of nonverbal communication. Among other higher primate species, the ability to appraise visual perspective is both common and strongly coincident with abilities for tactical deception of conspecifics (Byrne & Whiten, 1992). The ability for deception stands as the quintessential strategy of social intelligence, the natural ‘counterintelligence’ at which our species uniquely excels (Reddy, 2007, p. 622). In humans, the use of nonverbal acts to deceive others appears to arise as early in infants and toddlers as does the use of nonverbal behaviors to communicate honestly (see Reddy, 2007 for review). Conversely, very young children can recognize informative eyegaze cues “leaked” by verbally deceptive actors (Freire, Eskritt, & Lee, 2004). Inferences of nonverbal deceit by perceptual evaluations may even be implicitly encoded back to more central cognitive processes. Faces of cheaters in a cooperative game were better recognized than those of cooperators in a later memory task (Yamagishi, Tanida, Mashima, Shimoma, & Kanazawa, 2003). Similarly, faces in a gaze cuing study that were counterpredictive (putatively deceptive individuals) were more strongly encoded in memory and were also judged later to be less trustworthy than predictive (honest) faces (Bayliss & Tipper, 2006). Registering that an individual has attempted a deception, and is possibly a stably deceptive person are valuable results for socially-dedicated cognitive processes with important implications for future interactions and exchanges (Cosmides, 1989; Cosmides & Tooby, 1992). This study, therefore, adopted a basic experimental approach from social psychological research in which pairs of individuals participate in face-to-face interactions and serve alternately as the sources – and the targets – of social cues (Warner, Kenny, & Stoto, 1979). A virtual depiction of the testing stations used in this study. In this trial, the Sender (above left) would either try to gaze honestly at the probe on the left monitor or deceptively to the opposite, right monitor. The Receiver (above right) has to decide which monitor the probe is really appearing on, based solely on the Sender’s eye gaze, facial expression, and body movements. In groups of four, participants were matched with each of the other participants in turn. In each match, participants alternated between two roles. "Senders" sat in front of two side-by-side monitors and "Receivers" sat behind the monitors, with an unobstructed view of each other between the monitors. Senders were instructed (equally and randomly across trials) either to gaze "honestly" at an appearing probe or to gaze "dishonestly" at the monitor opposite the probe. Receivers attempted to report which monitor the probe appeared on. In honest trials, both participants were rewarded for correct responses, or penalized for incorrect responses. In dishonest trials, Senders were rewarded for incorrect responses (successful deceptions), and Receivers penalized. 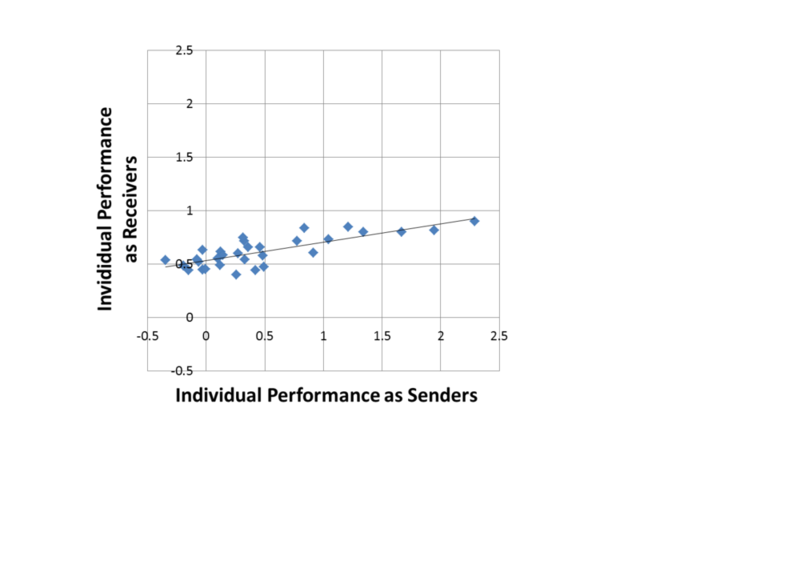 Receivers were rewarded for correct responses (detected deceptions), and Senders penalized. As Responders, participants’ overall performance was well within the range of performance typical of deception detection. The overall accuracy in classifying lies and truths was 54% in a meta-analysis of deception judgments from 206 sources (Bond & DePaulo, 2006). In the present study of deceptive and honest eye gaze classification, overall accuracy was 57% – significantly greater than that expected by random chance. Further, the calculated effect size of .69 would be considered large relative to an extensive survey of social psychological effects (Richard, Bond, & Stokes-Zoota, 2003). In an evaluation of accuracy for identifying honest gazes and dishonest gazes separately, performance was also comparable to that typical for detecting verbal deception. In Bond and Depaulo’s meta-analysis, truth identification alone was 61% (2006). In this study, honest gaze classification was 64% – significantly greater than random chance. In the meta-analysis, accuracy for lie identification alone was 47%. Deceptive gaze classification here was 49% and did not differ from that expected by random chance. There are meaningful differences between individuals in their ability to use gaze deception, but perhaps not in identifying gaze deception. The figure below illustrates how the participants' abilities to produce and detect gaze deception varied continuously. Receiver d’ shows how sensitive participants are at discerning honest from dishonest gazes. For example, the left and uppermost white disc represents an individual who correctly identified nearly 70% of deceptive gazes (termed hits) while only mistaking 4% of honest gazes as being dishonest (termed false alarms). Sender d’ shows how accurately each participant classified eye gaze behaviors. The left and uppermost grey disc represents an especially ‘transparent’ individual whose deceptions were identified nearly 80% of the time. The cluster of participants along the diagonal from the lower left to upper right corner were near, or even below, random chance. There is a strong relationship between the abilities to use gaze deceptively and to detect its use by other individuals. Early research has suggested that the skills for deception and deception detection might be distinct capacities (DePaulo & Rosenthal, 1979; Morency & Krauss, 1982). Here, it would be natural to expect that individuals who are better at identifying gaze deception are also themselves more adept in its production. However, the abilities for producing and detecting gaze deception appear to be strongly negatively correlated. As the chart of each participants d' below illustrates, poor Receivers appear to be less transparent as Senders, whereas good Receivers are more transparent in their attempts at gaze deception. More socially-adept individuals may be better at reading others expressions, including gaze deception. However, their greater sociality may involve a greater, and less repressible, degree of emotional expressivity. Less social individuals could likely be less sensitive to social cues signaling deception, but also less expressive and transparent themselves (e.g. Boone & Buck, 2003). Baron-Cohen, S. (1991). Precursors to a theory of mind: Understanding attention in others. In A. Whiten (Ed. ), Natural theories of mind: Evolution, development and simulation of everyday mindreading (pp. 233-251). Cambridge: MA: Basil Blackwell. Caporael, L. R., & Brewer, M. B. (1991). Reviving evolutionary psychology: Biology meets society. Journal of Social Issues, 47(3), 187-195. Cosmides, L., & Tooby, J. (1992). Cognitive adaptations for social exchange. In J. H. Barkow, L. Cosmides & J. Tooby (Eds. ), The adapted mind: Evolutionary psychology and the generation of culture (pp. 163-228). New York: Oxford University Press. Jonides, J. (1981). Voluntary versus automatic control over the mind's eye movement. In J. B. Long & A. D. Baddeley (Eds. ), Attention & performance IX (pp. 187-203). Hillsdale: NJ. Morency, N. L., & Krauss, R. M. (1982). Children’s nonverbal encoding and decoding of affect. In R. S. Feldman (Ed. ), Development of nonverbal communication in children (pp. 181-201). New York: Springer-Verlag. Richard, F. D., Bond, C. F., & Stokes-Zoota, J. J. (2003). One hundred years of social psychology quantitatively described. Review of General Psychology, 7, 331-363. Sorce, J. F., Emde, R. N., Campos, J., & Klinnert, M. D. (1985). Maternal emotional signaling: Its effect on the visual cliff behavior of 1-year-olds. Developmental Psychology, 21(1), 195-200. Tipples, J. (2002). Eye gaze is not unique: Automatic orienting in response to uninformative arrows. Psychonomic Bulletin & Review, 9, 314-318. Yamagishi, T., Tanida, S., Mashima, R., Shimoma, T., & Kanazawa, S. (2003). You can judge a book by its cover: Evidence that cheaters may look different from cooperators. Evolution and Human Behavior, 24, 290-301.